We are Dedicated to Serving Our Military Families! In 1944, the VA home loans program was born, and since that time, more than 18 million loans have been backed by the U.S. government. The VA was authorized to ensure farm, business, and home loans but this program was, at first, only available to troops who served during a particular time period. In 1992, VA eligibility was greatly improved. Many people misunderstand the home loans program to mean that the Department of Veterans Affairs actually funds these loans, but that is not the case. The VA simply backs, or insures, the loan so that in case of a default, both borrower and lender will be protected. This “insurance statement,” so to speak, gives lenders a great deal more confidence in funding loans for veteran borrowers, enabling lenders to offer lower interest rates and lower qualifications than with just about any other loan type. In fact, the benefits of the VA loan far outweigh benefits of FHA loans, conventional loans, and many others. This outstanding military benefits program has been changed for the better many times over the years, but still gives veterans and those actively serving in the military a very long list of benefits. It is simply unacceptable to not provide homes for those who have fought for us to be safe in ours, but the military benefits designed for veterans and service members allows many men and women to qualify for VA mortgages and find security and realize the dream of homeownership. Without the help of the VA loan program, some veterans might not be able to afford a house. The following is a basic breakdown of the important aspects of VA home loans. Taking the steps to understand what goes into your loan and what comes out is essential for your home buying success. Low VA Rates is here to help you understand military home loans and the process of home ownership. Many veterans don’t know or don’t understand the VA loan options available to them, so they aren’t taking advantage of their VA home loan benefits. As a result, many veterans are paying thousands of dollars more than they need to each year on mortgages. 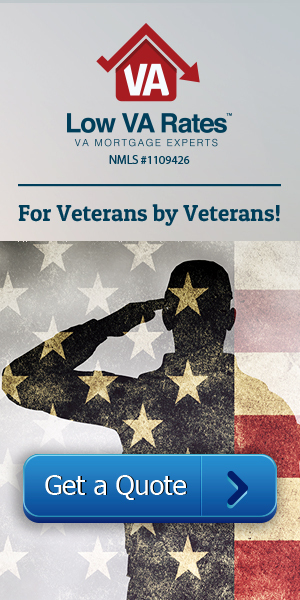 If you are in the military or have recently served, there is a good chance that you are VA loan eligible. If you meet all the requirements, you can obtain a Certificate of Eligibility (COE), which is available through the e Benefits website or through your lender. The process to receive the COE isn’t long—it only takes a few minutes—but it is an essential step to qualifying for VA loans. Eligibility depends almost entirely on when and how long you served in the military, but if you have served in the military for any amount of time, there’s a very good chance you qualify. The surviving spouses of those who have died in service are also eligible in some cases. Verify your eligibility with the Department of Veterans Affairs directly or call us here at Low VA Rates and we can help verify your eligibility as well. Below is a list of service time requirements that a military service member must meet in order to be eligible. One of the biggest perks of VA loans is extremely low-interest rates. In the home loan world, more trust leads to bigger benefits. Approved VA loans grant much lower rates than conventional loans because the VA backs them, providing security to the borrower and lender. The VA IRRRL, or Interest Rate Reduction Refinance Loan, often provides the lowest rates in the VA home loan spectrum and consequently in the world. Interest still varies from lender to lender and from borrower to borrower. When going through the approval process for a VA home loan, the lender will look at several important factors, such as debt-to-income ratio, credit score, and eligible military service, among other requirements, and determine from there which interest rate you qualify for. Interest rates also depend heavily on the market. For many years now, interest rates in the VA market have been dropping, and there’s no better time to take advantage of those low rates than now. Another important consideration to make regarding interest rate is that the numbers will change depending on the type of loan you get. There isn’t just one blanket VA home loan that either works for you or doesn’t. You still have the same options as with other loans: ARMs, Hybrid ARMs, fixed-rate mortgages, and jumbo loans, IRRRLs, cash-out refinances, and energy-efficient mortgages. Those are just the main options, but you may find even more depending on your financial situation and the lender. Why are there so many options? Because everyone’s situation is different, meaning some loans will fit perfectly while others just won’t. As such, there will be advantages and disadvantages to every loan option. Let’s take a look at some of the big ones. Many new homeowners find it difficult to save up thousands of dollars to pay upfront as a down payment on a house but then have little difficulty portioning their income to meet monthly payments. The VA understands this concept and as part of the VA home loans program, veterans and active service members are not required to pay a down payment, or they may pay a significantly reduced down payment. This is perhaps the most appealing and needed aspect of VA loans, and this is what enables many veterans to purchase a home; they don’t have to fork out thousands of dollars all at once. Every borrower is still allowed to pay down payment if they wish to, and doing so can be an extremely profitable decision. The only exception to the no-down-payment rule is the jumbo loan. With VA jumbo loans, a down payment is required but at only a fraction of what others pay with conventional jumbos (25 percent of the difference between the conforming limit and the house price). “No down payments” doesn’t mean the borrower doesn’t have to pay any money at closing at all. Veterans still have to pay closing costs, but there are limits on what the VA will allow them to pay. Origination Fee: This is charged by the lender to cover the processing costs and cannot exceed 1 percent of the loan amount. Credit Report: A fee is usually charged whenever someone pulls a credit score. The lender pulls credit in part to determine which interest rates you qualify for, and the fee has to be paid somehow. Appraisals: A professional will appraise the home to ensure everything is up to code; check for safety hazards; and calculate an accurate value of the home. In the case of jumbo loans, two appraisals are required. Title Insurance: In the case of title defects, liens, and other problems with the property, title insurance protects the lender. Recording Fee: A government official must legally record the official sale of the house, and the fee for this can be charged to the veteran when it costs under $17. Survey Fee: A survey will show property details, such as property lines and other boundaries. The survey performed at a new purchase is the inspection survey. Most every other charge due at closing must be paid for another way. Just a few of the items the borrower is restricted from paying include processing, underwriting, and escrow, among many other fees. Of course, part or all of the closing costs can be covered by the seller, just like with other loans, and if the borrower takes this route, they really won’t be paying anything out of pocket at closing. VA benefits aren’t limited to purchase loans. Several refinance options are also available that will give you further benefits. The most popular of all VA refinances is the IRRRL, also known as the VA streamline refinance. The IRRRL (and most VA refinances) will lower your rates to more affordable and manageable levels, and the IRRRL also takes significantly less time to complete than other loans. But there are also many other refinances to consider, such as the EEM (energy-efficient mortgage) and the cash-out refinance. In addition to these popular options, there are also helpful programs designed to get you back on your feet if you’ve missed too many payments or have a poor credit score. VA approved loans are almost always the best choice for veterans, so before you sign a conventional loan, take a look at what you could save by getting a VA loan through Low VA Rates. Already you can see the amazing advantages that make home buying a reality, and these are just the basics. Talking to one of our loan officers will clear up any questions you have and get you started on the easy path to home buying. We are happy to say that Low VA Rates has been in the VA business since the very beginning. Our team is trained to find the loan that will best fit your needs and to complete the loan process as efficiently as possible, so you don’t have to wait to save money on your home. Call us now to get started! CALL US TODAY | 855-223-0705 | Get Started For Free!